Since all effective care begins with careful evaluation, the end of suffering from TMJ disorder starts with an exacting and detailed analysis of your condition. Our advanced technology makes diagnosing TMJ disorder as accurate as scientifically possible. Your jaw joints are meant to operate like a well-oiled machine – quietly, smoothly and with minimal friction. When something is wrong, such as degeneration, cartilage tears, perforations and mechanical displacements, the surfaces become rough or poorly lubricated. Friction increases and the result is vibration, often so minute it cannot be detected without sensitive equipment. Doppler Auscultation is an ultrasound technology that helps us listen to the vibrating surfaces, and it is more accurate than many other measurement devices. We record and analyze the sound and duration of these jaw movement patterns and then compare it to a normal, healthy jaw joint. These measurements give us a more complete picture of your jaw function. 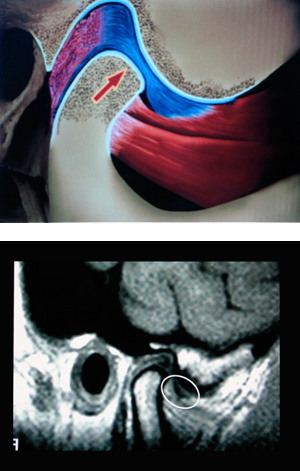 In addition to Joint Doppler Ultrasound, we also use 3-D CT scans, joint vibration analysis, study models on a 3-dimensional jaw movement simulator and, occasionally, Magnetic Resonance imaging (MRI) and Computerized Tomography (CT) scans as well. All of these evaluation methods help us get a complete depiction of your jaw and jaw movement for the most effective and complete TMJ treatment. Take the first step to finding relief from your most painful TMJ symptoms by contacting our office today.